Alrighty then! I just finished reading my first Gilbert Morris book. Yes, I do realize that he has been around for awhile (a long while) and that I'm sort of behind the times. I was just never drawn much to any of his books. That said, when I saw that Barbour Books was releasing a new title by Morris to be the first part of a three-part series (yes, just a trilogy this time, folks!) I thought now would be a good time to check this author out. 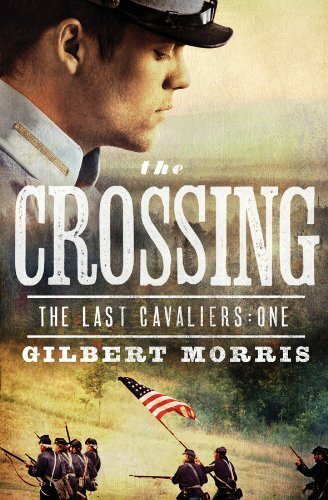 I just completed reading The Crossing which, as I mentioned, is the first installment of The Last Cavaliers. In this story the stage is set for us to meet young Yancey Tremayne, who is part Cheyenne Indian and part Amish to fight in the American Civil War/War Between the States. His father, Daniel, had married his mother (who was also part Chayenne Indian) and lived among the Indians even after her death. After Yancey's mother dies, he and his father are "encouraged" to go back to live among their own people. Daniel is Amish and has been shunned by the Amish community but his parents are still among the community and so he decides to take his young son back to live within this culture. While Daniel has an easy time re-adjusting to life among the Amish, his son does not. Not wanting to distance his son or lose the relationship, Daniel encourages to take a job working as a jack-of-all-trades for Thomas Jackson (a.k.a. Stonewall Jackson.) Yancey does so, finding favor with this famous Southern military genius and eventually serves under Jackson. Now, I do realize that many of you have spent years reading Morris and so, no doubt, his writing style is one you are well-aware of. I'll say as a first timer that I enjoyed his manner of story telling. I enjoyed the way Morris develops his characters over an extended period of time, giving the reader ample opportunity to know the story well. I also like historical fiction so it was a safe bet I'd enjoy this fact-and-fiction tale. I was equally amused that Morris was hitting all sorts of topics that Christian fiction writers love to touch on (i.e., the Amish, talk of horses, southern belles, etc.) I was amused but still entertained in an engrossing sort of way. I rather flew through this book as it was easy to do so. I genuinely wanted to know how this story played out. Knowing at least a little bit about Stonewall Jackson made this story all the more interesting and engaging to me. 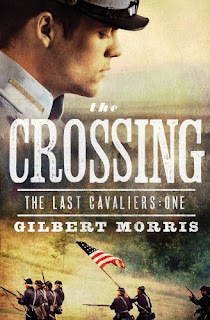 For myself, I enjoyed my first experience reading a Gilbert Morris book and have no qualms about recommending The Crossing if you like a tiny bit of romance, historical fiction and a flowing story line. I was never jolted out of the picture that Morris was trying to paint due to poor writing or use of modern expressions. I thought that Morris was pretty faithful to the timeline in which he had placed his story in terms of dress and language. He could be a bit too flowery on occasion, but not to the extent that I couldn't easily skip past it. All in all, I really enjoyed The Crossing . That's why I'm happy to let you know that Barbour Books have offered one copy of this book to one of my readers here at Reading to Know. Would you like to be entered to win? Simply leave a comment below. This giveaway is open to U.S. Residents only and will be open through Tuesday, March 8th. And a big thank you to Barbour Books for allowing me a chance to familiarize myself with this author and his works, as well as for their generosity in being willing to pass along an extra copy to one of my readers. Thank you! It seems that almost every work of fiction for adults has a bit of romance. Oh well. This does sound like a very interesting book. I've never read Gilbert Morris. I'm one of those people who grew up reading Morris, and yes, I'm dubious that the new series will be only a trilogy! :p I haven't read The Crossing yet, though. I haven't read anything by Morris, but I have been interested. This book sounds like a good starting point. I enjoy books about the Civil War and the Amish...this book would fulfill both interests at the same time!! I have read some Gilbert Morris, though it has been a while. I read another Civil War series that he wrote; I think it had seven books in it (!) though they were each shorter than the normal sized novel. I really enjoy historical fiction. I read Morris books when I was younger - the ones with the Winslow family. But, I haven't read anything of his in a long time, and wouldn't mind a light read. Hmmmm... I don't think I've read any of Morris' books. His name is familiar, though. Sounds like a book I'd be interested in. I enjoyed your review and would love to read The Crossing :) *Thanks* for the giveaway! This sounds like something I would enjoy. I have the first two books in his Singing River Series...still have to acquire the rest! This is a new author for me. I love books set in that time period. I LOVE these type of books! Thanks for the chance to win! I have never read any Gilbert Morris but this book sounds very interesting. I'll have to reconsider. kristiedonelson(at)gmail(dot)com Thank you. i have never even heard of this author but it sounds very interesting! Thanks for the opportunity to win one of his books!! I really enjoy Gilbert Morris' books. Thanks for offering this one. I have read almost all of his books. Sounds like a really fun book. Thanks for offering this giveaway. This would be a new author for me. I would love to be entered into your drawing. I've read lots of Gilbert Morris and would love to read this one! If it's not too late....I'd love a chance to win this book! :-) I like Morris' other books! I love books about the Amish and the Civil War. I haven't ever read anything by Gibert Morris yet, thank you for introducing him.